In recognition and celebration of the 70th anniversary of the NHS, discover the traces of East London’s medical past. 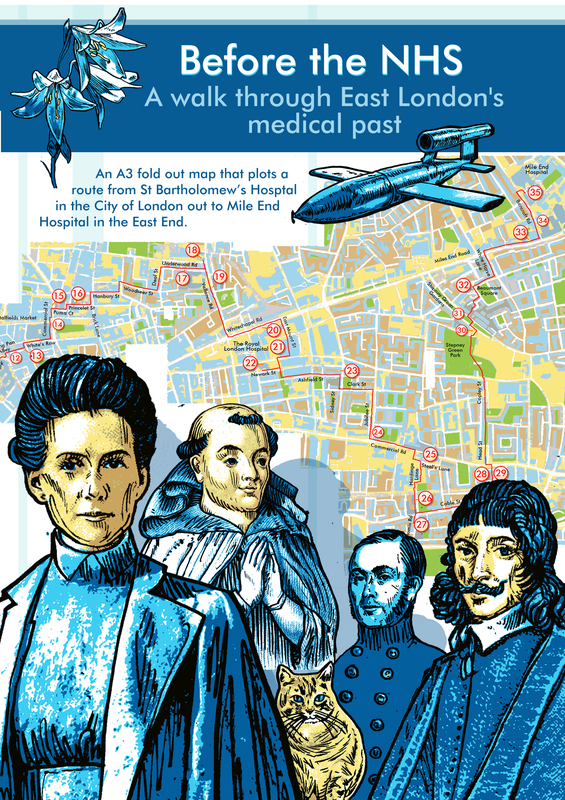 This map reveals the hidden relics of the hospitals that existed prior to the inception of the NHS, and links together St Bartholomew’s Hospital, The Royal London Hospital and Mile End Hospital. The map was commissioned for the 2018 Being Human Festival. The festival highlights the ways in which the humanities can inspire and enrich our everyday lives, help us to understand ourselves, our relationships with others, and the challenges we face in a changing world. London Hospital Museum) and Harvey Wells (Senior Lecturer in Medical Education, Barts and the London School of Medicine). Alban, Richard and Harvey launched the map at the Royal London Hospital Museum as part of the Being Human Festival 2018. As part of their research they walked the route and have made this film for you to enjoy.